Location Map: Where Is the Dordogne and Why Go? The Dordogne département (24) is found within the Aquitaine region of the southwest corner of France. Most French people refer to the area as the Périgord, a name used for the region before the French revolution; the region changed its name to the Dordogne in 1790. Why come to the Dordogne? Well, the beauty of the region is unsurpassed; rivers cut through limestone, leaving fantastic cliffs people have built around and into for thousands of years. The vast system of caves below the earth hold art so old it's difficult to think that people could have been so talented back then. And the cuisine is one of the best in all of the world. After all, the Perigord is known for Truffles and foie gras, two of the most sensuous tastes on the planet. You'll find lots of duck and goose cooked in interesting ways. There are many chateaus in the Dordogne as well, a density similar to the famous Loire castles, just less visited. The Dordogne is just inland from Bordeaux, so wine is no problem. Famous dessert wine is produced at Monbazilac, and cheap, adequate reds are produced around Bergerac. The Dordogne is compact and full of things to do. It's a great place to take the kids. Here is the entire Dordogne region. The region is divided into 4 parts, the orange dots represent the primary market towns. The Périgord Verte (green) is named for the verdant hills around the center, Nontron. Many rivers crisscross this section. The Périgord Blanc (white) is so named because of the landscape's exposed limestone, which has been used for building materials in the cities. The Périgord Pourpre (purple) is, as you might expect, a wine region. Wines take the names of the towns on the map, Bergerac, and Monbazilac. The Périgord Noir (black) is probably of the most interest to the traveler. It is here that the underground is laced with prehistoric painted and engraved caves--Over 150 sites line the Vézère river alone. The region is dark with trees, especially walnuts, for which it is famous, as well as being known for its black truffles. The center of the study of the region's prehistory is here as well, in the new National Museum of Prehistory perched on a cliff in the village of Les-Eyzies-de-Tayac. How much time need to visit Perigord Noir? If you like history, ancient castles and fortifications, prehistoric painted caves, natural beauty, and great cuisine you would not completely cover the area in a week. You'll save money by renting a vacation house for that length of time, either in the restored medieval center of Sarlat or the countryside. You'll need a car, despite the fact that there are train stations in Les Eyzies and Sarlat. Most of the allure of the Dordogne is found in the countryside. The map above shows the relationships between Sarlat, Les Eyzies, and Montignac, a golden triangle of history and prehistory. It doesn't take much driving to cover this area, the distance between Sarlat and Les Eyzies is only 10 km. To the east of Sarlat is the interesting pilgrimage site of Rocamadour. Les Eyzies - The National Museum of Prehistory, lunch at the Cro-Magnon Hotel (built into the limestone cliff, highly recommended cuisine and reasonable lodging prices), then a visit to Font de Gaume cave, just outside the tiny village of Les Eyzies. Most of the paintings here date back to the Magdalenian (12,000 bc). 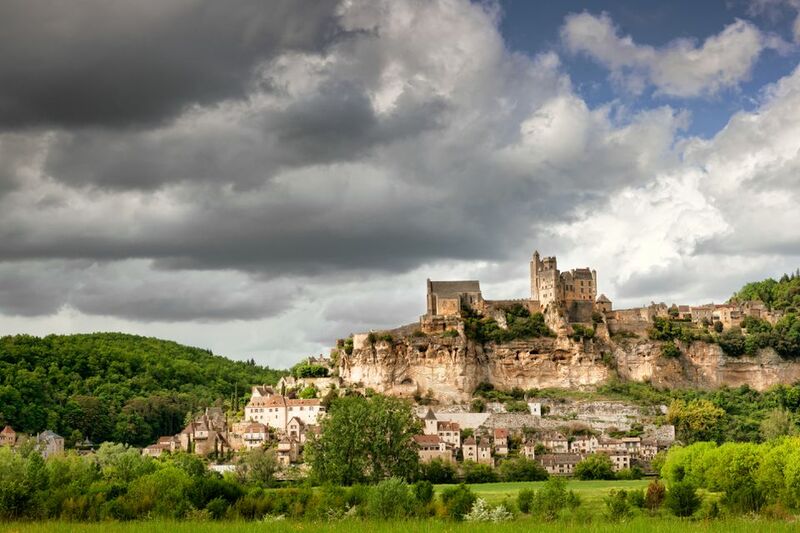 Beynac - Cap Blanc - Castelnaud - Visit the restored castle that crowns the picturesque town of Beynac, see the three-dimensional carved horses of Cap Blanc, then go to the castle at Castelnaud and see how all that siege machinery worked. Village Troglodytique de la Madeleine and Roque St-Christophe - where people have lived for 50,000 years or so. Founded in the eighth century, in Sarlat you'll find a beautifully restored 17th- and 18th-century core evocative enough for the town to be featured in many French films. Sarlat is located in the heart of the Perigord Noir and makes a fine base for your travels. That said, the medieval center of Sarlat is, indeed, a tourist town. While prices haven't skyrocketed, in restaurants you'll find English menu translations you'll be able to laugh over for years. Shops selling canned foie gras are everywhere. Foie gras shops are the tee shirt shops of Sarlat. But don't let that deter you. A stay in Sarlat will be rewarded by some great food and evocative views. The Saturday morning market is not to be missed. Sarlat is 550 km from Paris and has almost 11,000 inhabitants. There are plenty of restaurants--an abundance of them in fact. Sarlat also is on the Paris-Souillac-Sarlat and Toulouse-Souillac-Sarlat train lines. It takes around 6 and a half hours to arrive at Sarlat from Paris. You can stay in a hotel, of course, but it's much better to stay a while in a vacation home rental, where you can participate in the open air markets in this gourmet corner of France. HomeAway lists over 2000 vacation rentals in the Dordogne, more than 10 percent of them in Sarlat la Canada. Beynac is a wonderful little town to visit in the Dordogne. The Château de Beynac, crowning the limestone cliff, has undergone a recent restoration, and the interior is quite nice. The chateau is privately owned, but you can visit from 10 AM – 6.30 PM in-season for around 7 Euros. You can drive up, but parking below is recommended. It's a steep walk to the top, about 15 minutes. Near Beynac is the Chateau de Castelnaud, whose history begins with the Crusade against the Albigensians, when it was owned by Bernard de Casnac, a keeper of the Cathar faith. The castle has gone through two rebuilding/restorations, one between 1974-1980 and the latest from 1996-1998. Adults visit for 6.60 Euros, children 10-17 for half that. 10 and under walk in free (2005). Open all year, hours vary with the sun. In July and August, a tavern operates on the premises. Inside is the Museum of Medieval Warfare. Learn of weapons and siege machinery here through reconstructed weapons. Chateau de Castelnaud is a great place to take your kids if they like this sort of thing. Some educational programs are provided to youngsters. There are hundreds of caves within a 20 km radius of Sarlat--some open, some not. Here's a recommended list of prehistoric sites in the Perigord Noir. Cap Blanc - Like Horses? Well, 13,000 years ago folks carved a three-dimensional frieze at the back of a rock shelter featuring almost life-sized horses that seem to jump out of the wall. It's a short, but impressive, visit. Font de Gaume - Visitors can see thirty of the most beautiful cave paintings, most from about 12,000 b.c. About a mile south is Les Combarelles, with a profusion of intermingled engravings of many animals, the horse is represented most frequently. La Roque Saint Christophe - A stronghold in a limestone cliff, occupied from Cro-Magnon to relatively recent times. It features one of the largest natural terraces in Europe, with a great view of the river. Close by is the Prehistoparc, where your kids can see how life was lived by Cro Magnon. There are good walking trails here. The Dordogne, especially the Perigord Noir zone, is small enough that you might discover your favorite places just by driving around. If you have just a short time, a map and guide might help. When you arrive in the Perigord, look for a copy of The Paths of Prehistory in Perigord. It's a great introduction to the history of the region with great photos you won't be able to take, as well as some pretty nice maps. It's by Editions Ouest-France and the ISBN is 273732260x.